Filming on Skellig was an incredibly brave decision on the part of Lucasfilm given the risks associated with regular people getting to the island, much less an entire film crew. But JJ understood that, part of what gives Star Wars such enduring appeal, is that the locations play a key role in grounding the film in reality. And they needed a place that was real yet otherworldly for the role of Ahch-To. And they found it in Skellig Michael. As JJ described it, “it’s sort of a miracle, this place”. Check out the Behind the Scenes footage below for the full story of how this was done. Writer / Director, Rian Johnson, took over the helm for The Last Jedi and set what a significantly larger amount of the story in the Ahch-To location as Luke Skywalker trains Rey in the ways of The Force. Accordingly, shooting on the island for the amount of time needed would have been excessively risky and so a number of locations throughout Ireland, such as the Inishowen Peninsula, Ceann Sibeal in Dingle, and Crookhaven in Cork, were used as stand-in locations for parts of the movie with only the most iconic and spectacular footage being shot on Skellig Michael itself. 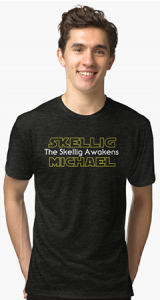 The appearance of Skellig Michael and Little Skellig in the Star Wars universe has, understandably lead to a huge surge in Star Wars-related film tourism to the area over the last 3 years with 2018 proving to be the busiest year yet for aspiring Jedis making their pilgrimage to Ahch-To, to stand in front of the Wailing Woman rock where Rey trained or on Christ’s Saddle, where Rey met Luke Skywalker.